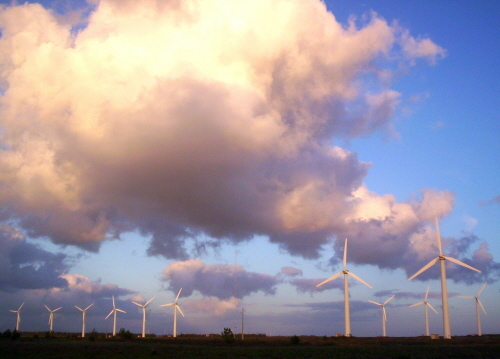 Harnessing the power of wind isn't a new idea but modern turbines make it a lot more efficient. Clean, green energy. Who can argue with that? Well us Weirdigans had a picnic lunch next to a bunch of them the other day and we chatted away merrily; didn't have to raise our voices at all. They make a bit of a swooshing noise when it's really windy - but that gets drowned out by the noise of the wind itself. Maybe they used to be noisy. Not any more. I guess ugly is in the eye of the beholder. They're not ugly to me. When I see them my heart sings and an involuntary smile spreads across my face. They have clean, simple lines; they move with symmetry and grace. They're majestic. Most of all, they are a symbol of Good. Of working with nature to get something we want - energy - without depleting the planet's resources. That, to me, is very beautiful. What about coal & nuclear power stations, giant supermarkets, industrialised farming? That's ugly. Turbines kill wild birds. It's true. Care must be taken; turbines should not be positioned on major migratory routes or in bird sanctuaries. But Dave Weirdigan found some interesting statistics the other day. More birds are killed by cars than by windmills. More are killed by cats. And, believe it or not, more are killed by crashing into house windows than are killed by turbines. So, should we ban cars, cats and houses? Probably... but what we shouldn't do is ban wind turbines. So often, standing up for what's right means being 'anti'. Anti-war, anti-nuclear, anti-GM, anti-capitalism, anti-globalisation. Against new road building, against airport expansion. Well here's something to be for. 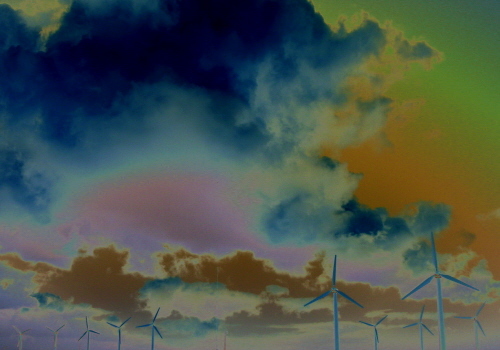 For wind turbines; in favour of them, encouraging, promoting, enjoying them. Ask your local council to get some. Lobby local farmers to rent their fields to turbine-builders. Fight those nimby 'no turbines in our green and pleasant land' types. Point out to them at every opportunity that turbines are terribly green and that without them the environment will soon be pretty unpleasant. Anywhere you hear of protests against proposed windfarm developments - turn up and protest for them.